Dr. Justine Lee has some great tips to keep your dog safe during summer festivities. For more from Dr. Lee, find her on Facebook! Ah, summer…the start of backyard BBQs and picnics outside. While I want to encourage you to spend more time outside with your pooch and your family, keep in mind that when picnicking, there are several dangerous food items that can pose a threat to your dog when accidentally ingested. More importantly, make sure your friends and family are aware of these risks to your dog, and advise them to never feed your dog any snacks without your permission. 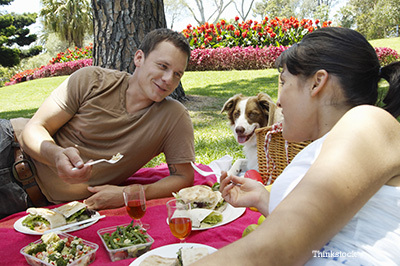 By just being aware of these 5 picnic dangers, you can save yourself a several thousand dollar veterinary bill and an emergency trip to the veterinarian! Unfortunately, clinical signs often aren’t obvious until days later, when it’s more costly – and more dangerous – to your pet. Treatment includes decontamination, aggressive intravenous (IV) fluids, anti-vomiting medication, blood pressure monitoring, urine output monitoring, and blood work monitoring (to check kidney function). lethargy (which are all signs of a low blood sugar). Really high doses of xylitol can result in liver failure in dogs, and include signs of black tarry stool, jaundice (e.g., yellowing of the gums), malaise, walking drunk, and rarely, seizures and death. Treatment includes decontamination, blood sugar monitoring, dextrose supplementation, drugs to protect the liver, and monitoring liver function. Believe it or not, left untreated, these picnic foods can cause the intestines to rupture and, potentially, death. When in doubt, keep these picnic items out of reach. Keep in mind that the sooner that you recognize that your pet is poisoned, the easier it is to treat and the less dangerous (and less expensive) it is to your dog. Enjoy your summer with your dog, but pay heed to these common picnic pet emergencies!